This article is a short summary of New Super Mario Bros. 2. 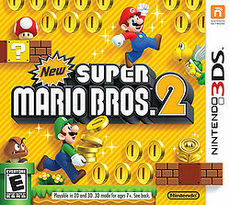 New Super Mario Bros. 2 is a 2D platforming Super Mario game, and the third game in the New Super Mario Bros. series. The game places an emphasis on collecting coins, the the main objective being to collect one million, while also drawing several elements from Super Mario Bros. 3. New Super Mario Bros. 2 is the first Nintendo title overall to be simultaneously release both physically at retailers and digitally on the Nintendo eShop. In addition, the game is also the first Nintendo game released outside Japan to support paid downloadable content, the first overall being Fire Emblem Awakening. New Mario. For everyone. For all time. The Mushroom Kingdom is bursting with coins! Can you collect a million coins? Gold Flowers, Gold Blocks, and Gold Rings –collecting coins has never been so fun! Team up with a friend and play through the entire game! Requires two game cards (each sold separeately). Use all your speed-running and coin-collecting skills to best your friends in the new StreetPass enabled Coin Rush mode. The bros are back for an all-new adventure worth its weight in gold! Jump, bounce, and power-up through visually stunning side-scrolling worlds as you race to save Princess Peach. Gold Flowers, Gold Blocks, and Gold Rings make collecting coins more fun than ever! Can you collect a million coins? Use all your speed-running and coin-collecting skills to best your friends in the new StreetPass-enabled Coin Rush mode. At Princess Peach's castle, Mario and Luigi take off in their Raccoon forms to collect coins in the sky, but upon their return, they discover that the Koopalings have kidnapped the princess. Thus, the two set out to rescue her. New Super Mario Bros. 2 plays similarly to the previous entries in the series. Because of the focus on coins, stages now features more coins than they normally would, and new items and power-ups have been added to help in collecting coins, such as the Gold Flower and Gold Rings, while Raccoon Mario returns as a form with the Super Leaf. The game keeps track of the total amount of collected coins through a counter that is shared between all save files and Coin Rush. Two players with a copy of the game can also play through the main game in a two-player local co-op mode; players share a coin counter and a life counter, and an individual item store; most other mechanics are taken from New Super Mario Bros. Wii. The game also features a new mode, Coin Rush, in which players must travel through three stages within a more strict time limit, collecting as many coins as possible. Losing a life at any point automatically ends the challenge, and players must restart from the beginning of the challenge. Players can also send their recorded Coin Rush record over StreetPass, which allows other players to challenge them. Before playing through a round, players have the option to use standard Mario, or the invincible White Tanooki Mario. New Super Mario Bros. 2 features ten downloadable Coin Rush course packs released over the course of several months after the release of the original game. Each course pack comes with three courses played in a set order for region price (US$2.50 each). Course packs are purchased through the in-game shop, and can be purchased either individually or in bundles. Gold Classics Pack: Released between sets, courses originally from classic Super Mario games updated to give many coins.